Colouring in.- Think about what colours match the mood of the bear. Colour the parts of the body where you can notice changes when you feel this way. 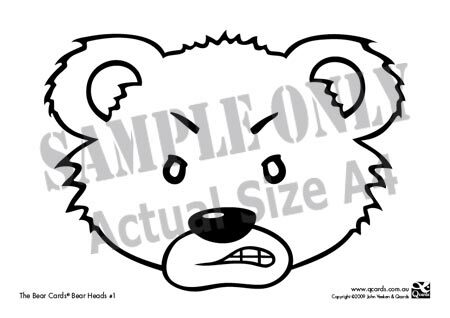 Drawing and colouring.- Think about what shapes you could draw around the bear to match its mood. Draw a background scene to match the feeling. Writing.- Write words on or around the bear that describe how it is feeling. Write the things that make you feel that way. Display.- Put up a poster of the bear you want to be. Put up posters of the feelings being discussed in class. Make an extra set of cards. Describing emotions – Write on each bear how you think it feels. Compare and discuss the written descriptions. 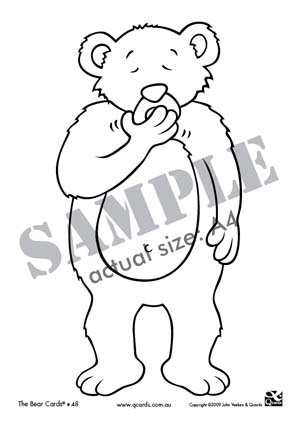 Take home bears – Use The Bear Cards to choose bears showing how someone would like to feel. Cut out those bears from the pages and give them to keep as a reminder. Drawing.- Draw the facial expression of how you feel. Colouring in. – Colour the parts of the body where you can notice changes when you feel this way. Will need to be printed onto heavy paper or glued to card before cutting. Double sided tape is recommended for assembly. The Feelings Dice shows 6 of the most common basic feelings: happy, sad, angry, disgusted, worried and scared. Roll the dice, name the feeling and act it out using facial expression and body language. Roll the dice, name the feeling and describe what makes you feel this way. Roll the dice, name the feeling and describe the last time you felt this way. Will need to be printed onto heavy paper or glued to card before cutting. Instructions are printed on each page. Great for role playing and lots of fun! If you have any stories on how you have used the masks, please let us know. If we publish it on our site, we will send you a free set of cards. Colouring in.- Think about what colours match the mood of the bear. 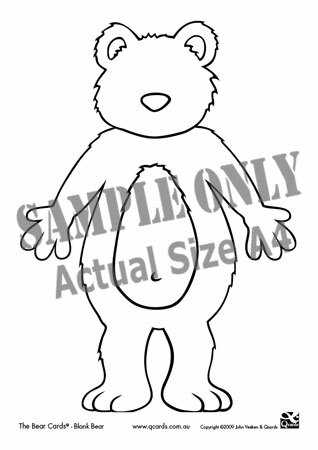 Drawing and colouring.- Think about what shapes you could draw around the bear to match its mood. Draw things around the head to match the feeling. Writing.- Write words on or around the bear head that describe how it is feeling. Write the things that make you feel that way. 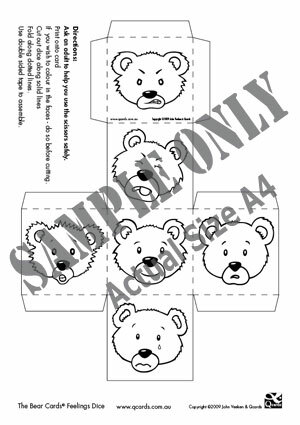 If you have purchased The Bear Cards, you can access the downloads free by clicking on the above “Add to cart” button, proceeding to checkout and using your 6 digit special passkey in the “Have a coupon?” prompt at the top of the checkout page. 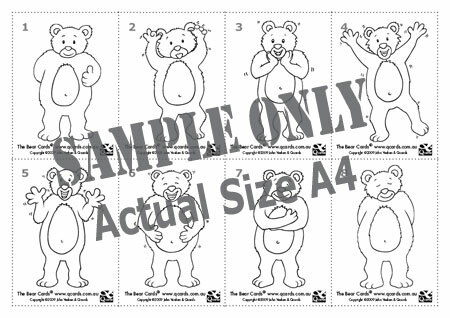 Please note that The Bear Cards Downloads are copyright to Qcards’ contributors. The work may be printed for personal, therapeutic or educational use only. No part of the work may be further transmitted in any form or by any means, electronic, mechanical, photocopying, recording or otherwise, without the prior written permission of the publisher.